Scholars do not know what season of life King David was in when he wrote this but some believe it is when his son Absalom was trying to take over and kill David. In the middle of this battle, this pain, David wanted to get closer to the Lord. May the theme of our prayer life be to draw closer to Him. As we draw closer this scripture tells us what will happen. 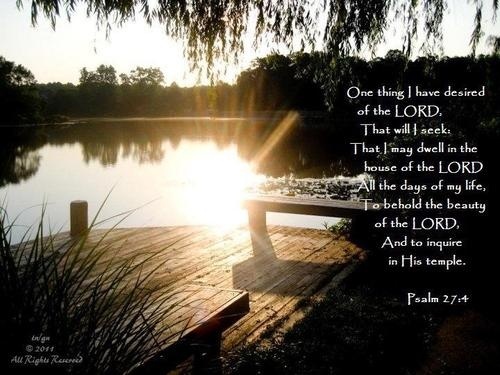 The Lord will conceal us in times of trouble. He will hide us in His sanctuary ,His tent, His inner chamber. Just like the executive residence of the White House, it is protected. Guaranteed protection. He will place me out of the reach of the enemy. We will never get rid of the troubles of this life. BUT, we can be in a place where we are just out of the reach of our enemy. Know God is on our side. IF God is for me, whom shall I fear? He NEVER lets go of us. Lord, May I never lose the wonder of your mercy. My hope is in you Lord. I want to draw closer to you. Hold my hand. Hold my heart. Just as King David said, I want to live with you forever. Lead me to new depths of the river . New depths with you Lord. This entry was posted in Christian Inspiration, Daily Devotion, Encouragment, Mercy, Pray and tagged King David, Mercy, Pray, Prayer. Bookmark the permalink.